We've all done it. We encounter a problem and run the usual phrase through our minds: "There has to be a better way." One of the most important items in the restoration process of our classic car is ensuring that the fuel system will deliver a clean, reliable stream of fuel to the engine. That means the fuel tank has no debris like small stones, flakes of rust or other undesirable contaminants that can clog the fuel line or carburetor. Maybe it's a tank that is from a car that's a 40 year old barn find or it's a tank that was purchased at a flea market and it sat outside in the rain and snow for 20 years. In your heart you know that opening up the tank — either at a seam or using a die grinder and cutting a square hole — the tank will never be the same. It will still require crimping and resealing the seam or repairing the hole using common metal fabrication methods like Mig welding a patch and grinding it smooth. The tank could also be an exposed one like most cars of the teens through the twenties. These may require that the exterior has to be perfect. Looking for a replacement tank you may find one in equal or worse condition. Rarely will you ever find a NOS tank. Inside a quick visual inspection shows an even coating of rust on the side walls and equal amounts on the baffles if your tank has those. If the car was put away 40 years ago with some gas still in the tank, it's a guarantee that there will be a layer of dried gas looking a lot like varnish or your grandmother's molasses. It will be thick, goop, and unlike molasses, no matter how long you wait with the tank upside down, it will not flow out. Adding an open flame heat to soften it is a dangerous proposition as fumes could still be ignited, even after more than 10 years of sitting to the open air. Methyl Ethyl Ketone (MEK) one of the active ingredients in most paint strippers will remove most of the thick varnish coating, but is an expensive proposition since several gallons could be needed. And MEK does not address the coating of rust. Photo 1 is a cross section diagram of a tank with both baffles and reserve chambers. 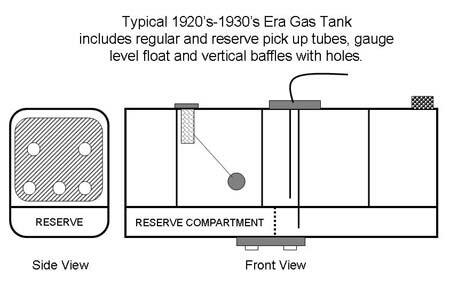 Photo 1 — A cross section diagram of a gas tank with baffles and reserve chambers. Not all tanks are this elaborate but it shows the various areas where rust can form which can't be seen from the filler neck or the opening where the gas tank sending unit is inserted. We're going to look at using electrolysis as a way to remove rust from gas tanks. Electrolysis is the passage of a direct electric current through an ionic substance that is either molten or dissolved in a suitable solvent, resulting in chemical reactions at the electrodes and separation of materials. In chemistry and manufacturing, electrolysis is a method of using a direct electric current (DC) to drive an otherwise non-spontaneous chemical reaction. Electrolysis is used commercially as a stage in the separation of elements from naturally occurring sources such as ores using an electrolytic cell. The technical definition of the voltage needed for electrolysis to occur is called the decomposition potential. You submerse the rusted part in a non metallic container (a plastic spackle bucket will do) with a solution of Sodium Carbonate or "soda ash" (Na2CO3), such as Arm & Hammer Washing soda found in the laundry section of your grocery store. Sodium Carbonate is also found in Hot tub chemical section of your local Home Store (Menards, Lowes, HD, etc.). Make sure you don't use baking soda, that's Sodium Bicarbonate (NaHCO3) which will not work. The part to be cleaned is connected to the negative polarity of the direct current source and the Anode is a piece of steel such a Rebar used in concrete reinforcement. Several amps of Direct Current (DC) electricity from a battery charger or power supply will lift off the rust and deposit it to the Anode lead (Rebar). In hours or days, the part will be shed of the layers of rust and ready for the next step in refinishing. Basically, we're using DC electricity from a power supply (battery charger) connected to the rusted part ,and a donor piece of ferrous (iron) metal immersed in a solution of water and Sodium Carbonate. The negative lead is connected to the rusted part and the positive lead is connected to the donor metal which will collect the rust deposits (Photo 2). 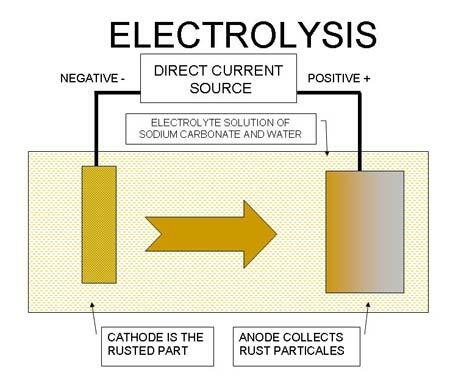 The electrolyte solution (dissolved in regular water) and when the electricity flows, the rust is forced off the rusted part and mostly deposited onto the donor metal. Some rust particles are forced off, but fall into the container. 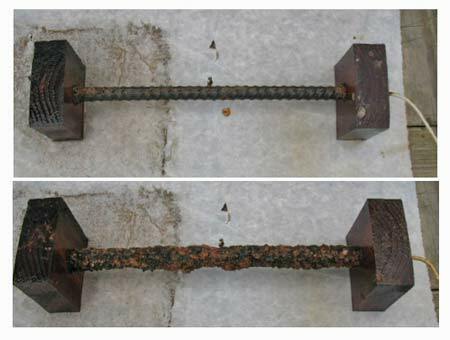 The Electrolysis method for rust removal is not new, but this article examines its application for use in two cleaning gas tanks, one an automobile tank and the other a small gallon tank. Gas tanks of the teens through the 1950's and even later can have a number of chambers created with the inclusion of baffles. Cleaning tanks with multiple baffles has traditionally been difficult and the electrolysis method is just one more tool in our arsenal of restoration methods. The difference here is that the metal tank is treated as the Cathode and it's filled with the electrolyte solution and the positive Anode that collects the rust deposit is suspended inside (Photo 3). And more importantly this is done without cutting open the tank! Photo 2 — The basic diagram of Electrolysis rust removal. A non conductive container (5 gallon pail or Rubbermaid container) is filled with water, several tablespoons per gallon of Arm & Hammer brand powder washing soda laundry detergent, the rusted part (called the Cathode) connected to the negative lead of the direct current power and the Anode, the metal that will collect the rust while the electrolysis process is taking place. 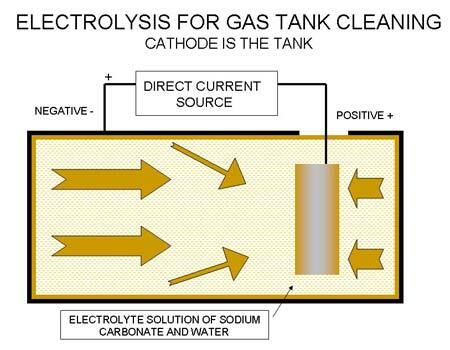 Photo 3 — The basic diagram of the Electrolysis rust removal for gas tank cleaning. The tank is filled with Electrolyte solution of water and Sodium Carbonate and the Anode is suspended inside the tank before connecting the DC source. A direct current (DC) supply: provides the energy necessary to create or discharge the ions in the electrolyte. Electric current is carried by electrons in the external circuit. Two electrodes: an electrical conductor which provides the physical interface between the electrical circuit providing the energy and the electrolyte. In our case the gas tank itself is one and the other is suspended inside the tank. Photo 4 is the result of a tank project that went bad. A shop cut open this 1920's tank to reveal what was already known by the owner/restorer, that there were two vertical baffles inside that created three chambers. Additionally this tank was designed with two reserve chambers, along the bottom. Since the tank was already cut open and the damage done, the electrolysis process was applied albeit easier. A length of concrete rebar was used as the Anode cradled by scrap wooden blocks. Since electrolysis is so dependant on electricity, the rebar end was drilled and 14 gauge stranded wire was soldered into the hole (Photo 5). Photo 5 also shows the result of a few hours of the electrolysis process. The rusty Anode is easily cleaned using a small wire brush. Photo 4 — This tragedy didn't have to occur. A 1920's era tank was cut open by a shop only to have the shop give up and return the tank to the customer in pieces. Since the tank was already cut open, the electrolysis cleaning was performed as outlined in this article. Photo 5 — Top: Rebar segment with a long length of stranded wire soldered into the end. The scrap wooden blocks act as insulators. Bottom: The same Rebar after a few hours of electrolysis operation. The rust collected is easily removed using a small wire brush and a quick rinse in fresh water. As rust is formed on the Anode, the current draw will decrease. At 50 percent or less of the initial current is a good indicator of when the Anode requires cleaning. Another example of tank cleaning is this 5 gallon tank for a small portable generator (Photo 6). The generator was abandoned when the engine seized and they left the tank open to the weather. 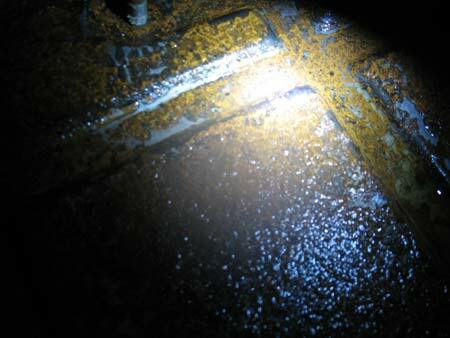 Photo 7 shows the condition of the tank's bottom surface where most of the rust had formed. 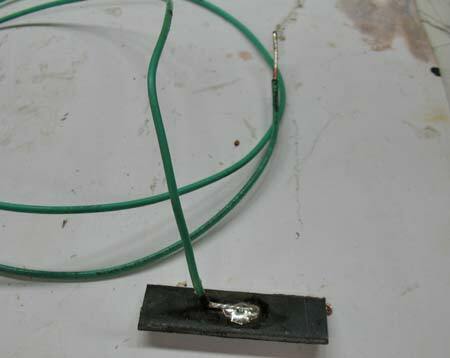 Photo 8 is the flat stock steel Anode with stranded wire soldered to it. In this case a simple spring clamp kept the Anode suspended inside the tank, as low as possible without touching the bottom (Photo 9). Another possibility could have been to use vinyl tubing on the ends and/or tape or wire ties to make insulators on the tips of the Anode. What is important is to create an Anode that has as large of a surface area as possible. Simply dunking a wire in the electrolyte solution will collect rust quickly requiring cleaning every 5 minutes. Ingenuity is needed for your particular project and no two cases are alike. Photo 10 shows the Anode after a few hours of operation. Not all rust gets deposited onto the Anode as Photo 11 shows. Draining the solution from the tank into a bucket reveals the rust that got dislodged from the tank and was floating in the solution. Photo 12 shows the result after 10 hours of electrolysis cleaning. The tank was air dried, rinsed of Muriatic Acid followed by an application of a national name brand sealer and this tank was fit to be put back into service. Photo 6 — This tank on a portable generator was left open to the weather and a healthy film of rust collected inside. 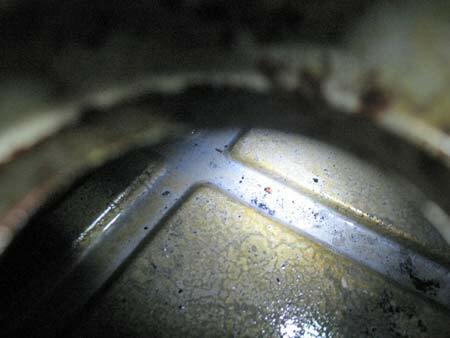 Photo 7 — Close up view of the inside of the generator gas tank. Rust has formed and started to leach into the metal surface. The Electrolysis process will clean both surface and crevices. Photo 8 â€“ Anode is a segment of flat steel stock with a stranded wire soldered to it. Photo 9 â€“ A simple spring camp suspends the Anode by its green stranded wire in the tank just above the bottom to prevent shorting out. The electrical spring clip on the flange is the Cathode (negative) connection. A better connection would have been on the tanks flange away from where gas may form. 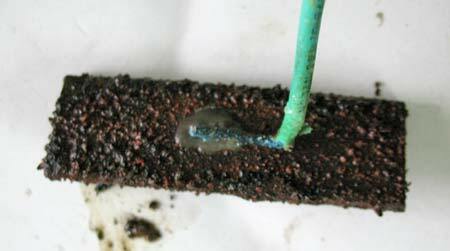 Photo 10 â€“ After a few hours of Electrolysis, rust is forming on the Anode. A small wire brush easily cleans it off and is put back into the tank for more cleaning. Photo 11 â€“ Not all the rust removed from the tank's inside is collected onto the Anode. Here the electrolyte solution was drained into a bucket and strained for the picture to show the amount. 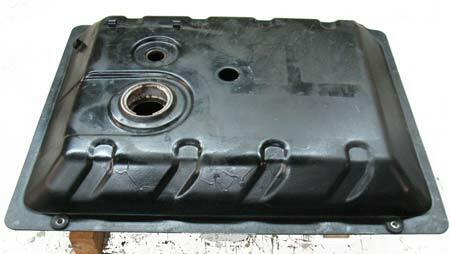 Photo 12 â€“ The same generator gas tank after the electrolysis cleaning procedure was applied. Notice how it pulled the rust from the pit holes and crevices. Anodes (Electrodes) of ferrous metal, or graphite material are widely used. Choice of the suitable electrode depends on shape and method of suspension. Do not use stainless steel as an Anode. An important note on safety. Electrolysis creates Hydrogen Gas while the current is flowing and can be flammable or dangerous if inhaled. 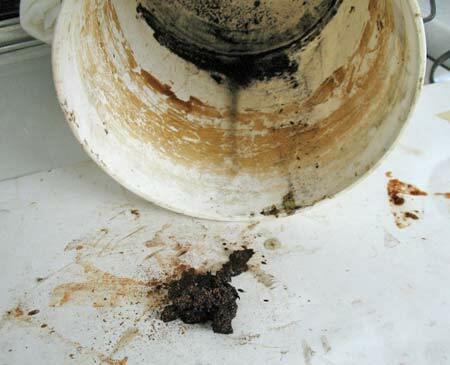 Perform this cleaning in a well ventilated area and disconnect the power source and wait 3 minutes for vapors to escape. Always disconnect the wire leads away from the area where the electrolysis is taking place. This is the reason why long leads are connected to the Anode and the tank. It doesn't take much Sodium Carbonate (Arm & Hammer detergent) to make the electrolysis to work. Two or three tablespoons per gallon are enough. Adding more to the solution doesn't accelerate the process. The solution should periodically be replaced, say every 8-10 hours. Since rinsing with hot water is a part of the cleaning, start with a fresh solution each time after rinsing. The cost of the washing soda is low, so replacing the solution is no big deal. The Arm & Hammer brand washing soda seems to work best, though it's not the only source of Sodium Carbonate. Hot tub and pool supply are also sources for sodium carbonate. The Anode's size and surface area makes a difference. The greater the surface area, the more rust will be deposited on it. A piece of steel rebar works and may fit into narrow passages, but its round shape limits the surface area requiring you to change it often. Consider other shapes like 1/8 inch think cold rolled 1 X 2 or pipe/rod that is bent or curved to fit your situation. Solder the lead wire to the Anode to make the best electrical connection. You can be creative in its shape to suit your particular needs and add insulators at the ends. 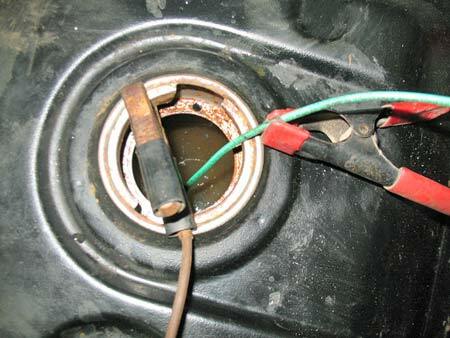 It's important to prevent the Anode from touching the gas tank directly. Watch the ammeter on the DC power source. When the ammeter drops below 50 percent of the start value, the Anode needs to be cleaned. If your power source doesn't have a meter, check the Anode every 2-3 hours. Better yet, have a spare Anode handy and swap them. The closer the Anode is to the rusted area, the better the electrolysis. Move the Anode around from one portion of the tank to another every few hours. You may have to repeat an area for heavily rusted areas. Make a good connection of the negative lead to the tank to a section to where gasses won't be escaping. A little spring clip may not be enough. A small C clamp or Vise grip pliers onto a sanded area should make a good connection. A benefit of Electrolysis is that it heats the electrolyte and may warm the contaminates to allow them to pour out during rinsing. You're not limited to a single power source. Multiples power sources can be employed to accelerate the cleaning process. Don't let the Anodes touch each other. You can apply the Electrolysis cleaning to your project tank before or after being boiled out by a local shop (sometimes radiator shops offer that service) to remove any lingering contaminates. Typically boiling out doesn't remove heavy rust only surface debris. Apply sealers following the instructions of that vendor. Paint the exterior appropriate for your project. At the conclusion of the cleaning process, inspect your tank for structural integrity at the bottom, top, sides, and the baffles. Check for pin holes in the bottom and all sides, a common occurrence for tanks that have had old fuel sitting for long periods of time. 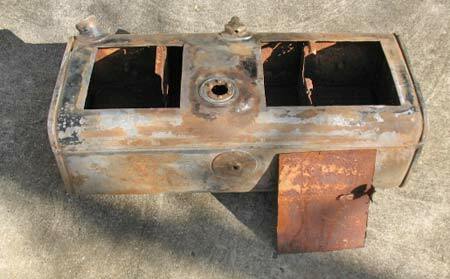 Also make a determination if the tank is structurally sound as rust and corrosion may have thinned the metal. Using a bright light inside the tank in a dark room is one method to reveal pin holes. Apply some common sense on whether your tank is still a good candidate, if you should seek a better replacement, or have it repaired. Soldering small holes on the tank's exterior may be needed along with the sloshing sealer to address small pin holes.